The GMA Safety and Liability Management Grant program was introduced in 2000 to provide a financial incentive to assist members in improving their employee safety and general public liability loss control efforts through training and the purchase of equipment or services. 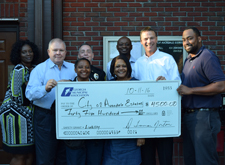 Since the inception of the program over 130 cities have received grant money, over 500 grants were approved totaling nearly $1.5 million to fund items such as bulletproof vests, training videos, confined space entry equipment, reflective safety vests, fire department turnout gear, and police department in-vehicle video systems. These grant funds have helped leverage the purchase of over $2.6 million in this type of equipment and training. The Safety and Liability Management Grant program is made available to members of GMA’s property and liability insurance program (the Georgia Interlocal Risk Management Agency) and GMA’s workers’ compensation insurance program (GMA Workers’ Compensation Self-Insurance Fund).